Remember the infamous scene in Speed where a bus jumps a fifty foot gap in an elevated freeway? Of course you do, because every physics teacher from that day on illustrated that moment as something that could never, ever happen. Although the freeway was elevated, the bus was careening down a flat section. It would have fallen down from the edge of the freeway the same way a ball rolling off the edge of a table would. Gravity doesn't care if you're going very fast. What's more, since the front section of the bus moved off the freeway first, it would have started falling while the back section of the bus was still being supported. This would have sent the bus into a spin, and if the fall were long enough it would have tumbled end over end into the ground. Buses don't generally inhabit regions where they can go tumbling end over end, but animals do, and the more likely they are to slip, to jump, or to go into free fall, the more likely they are to have tails. A group of UC Berkeley scientists took a look at this, especially the way leaping lizards use their tails to control their falls and their jumps. The lizards bring their tails up towards their own backs at first, this forces their upper body up and back towards the tail, letting them reach up higher. Later, when lizards notice that they may have overshot their goal, they curl their tails forward and under their bodies, forcing their upper bodies forward and down, again moving towards the tail, and letting them reach down and forward to control their landing. The team, lead by Robert J Full, a professor of integrative biology, decided to do their own version of the Speed jump. They made a little toy car, gave it a tail, and put it on a ramp. At first, when the tail was loose and uncontrolled, the car did just what the bus should have done. Its front end dipped and it went into a spin downwards. By forcing its tail up and forward, it forces the front of its move up and back. The car keeps its front end up and prevents a spinning fall. We imagine the robots of the future as bipedal humanoids. Perhaps that's being speciesist. 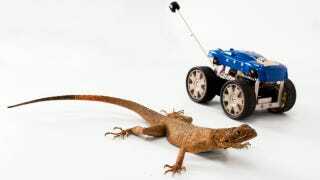 Maybe the fantastic machines of the future will look like gigantic lizard-men, hopping robo-kangaroos, climbing robot rhesus-monkeys, and long-tailed, perfectly steady off-road vehicles.